भवत:/भवत्‍या: ग्रामस्‍य नाम किम् - आपके गाँव का क्‍या नाम है ? भवान/भवती कुत: - आप कहाँ से हैं ? भवत:/भवत्‍या: प्रदेशस्‍य नाम किम् - आपके प्रदेश का नाम क्‍या है ? भवत:/भवत्‍या: देशस्‍य नाम किम् - आपके देश का क्‍या नाम है ? भवान/भवती कुत्र कार्यं करोति - आप कहाँ कार्य करते हैं ? भवत: पिता किं करोति - आपके पिता जी क्या करते हैं ? भवत: पितु: व्‍यवसाय: क: - आपके पिता का व्‍यवसाय क्‍या है ? भवत: मातु: व्‍यवसाय: क: - आपकी माँ क्‍या करती हैं ? भवत:/भवत्‍या: पत्र संकेत: क: - आपका पता क्या है ? भवत:/भवत्या: जालपुटसंकेत: क: - आपका ईमेल आईडी क्‍या है ? भवत: जालपृष्‍ठसंकेत: क: - आपका वेबसाईट/ब्‍लाग आईडी क्‍या है ? भवत:/भवत्‍या: चलभाषसंख्‍या का - आपका मोबाईल नम्‍बर क्‍या है ? ruchikar hai...hindi tools gayab ho gaya hai...sanskrit men likhne ka prayas karunga. 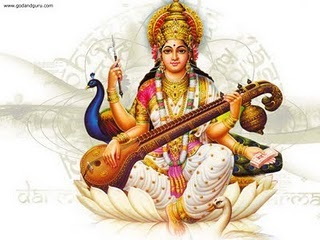 या कुंदेंदु तुषार हार धवला, या शुभ्र वस्त्रवृता. या वीणावर दंड मंडित करा, या श्वेतपद्मासना. सा मां पातु सरस्वती भगवती नि:शेष जाड्यापहा. victory and defeat, gain and loss, pleasure and pain, get ready for the fight,then: fighting thus you will not incur sin. ततो युद्धाय युज्यस्व नैवं पापमवाप्स्यसि. मा कर्मफलहेतुर्भूर्मा ते संगो अस्त्वकर्मणि. Your right is to work only, but never to fruit therof. Be not instrumental in making your action bear fruit, nor let your attachment be to inaction. स्थितधी: किं प्रभाषेत किमासीत व्रजेत किं ? What is the definition of a God realized saul-stable of mind and estaablished in samadhi (perfect tranquility of mind)?, How does the man of stable mind speak, how does he sit, how does he walk? when one thoroughly dismisses all cravings of the mind, and is satisfied in the self through (the joy of) the self, then he is called stable of mind. The sage, whose mind remains unperturebed amid sorrows, whose thirst for pleasures has altogether disappeared, and who is free from passion, fear and anger is called stable of mind. He who is unattached to everything, and meeting with good and evil, neither rejoices nor recoils, his mind is stable. if the last alphabet of a word is halant and just next word begins with consonant then it will be anuswar eg. आवश्‍यकं भवति (कम्-भ कं-भ) , and if there is a vowel word before halant word then it will be मkar with hal eg. आवश्‍यकम् अस्ति (कं-अस्ति कम्-अस्ति)! thank you very much for explaining about the halant rule thing. But I had asked some thing about- how to put halant sign while writing in Devnagri. When like a tortoise, which draws in its limbs from all directions, he withdraws his senses from the sense-objects, his mind is (should be considered as) stable. रसवर्जं रसोप्यस्य परं दृष्टवा निवर्तते.(59). Sense: (krushn says further)-objects turn away from him, who does not enjoy them with his senses; but the taste for them persists. This relilsh also disappears in the case of the man of stable mind when he sees the Supreme. O Kuntiputra Arjuna, turbulent by nature, the senses even of a wise man, who is practising self-control, forcibly carry away his mind. वशे ही यस्येन्द्रियाणी तस्य प्रज्ञा प्रतिष्ठिता. Therefore, having controlled them all and collecting his mind one should sit for meditation, devoting oneself heart and soul to Me. For he, whose senses are mastered, is known to have a stable mind. The man dwelling on sense-objets develops attachment for them; from attachment springs up desire, and from desire (unfulfilled) ensues anger. From anger arises infatuation; from infatuation confusion of memory; from confusion of memory, loss of reason; and from loss of reason one goes to complete ruin. The self-controlled practicant; while enjoying the various sense-objects through hs sense, which are disciplined and free from likes and dislikes, attains placidity of mind. With the attainment of such placidity of mind, all his sorrows come to an end; and the intellect of such a person of tranquil mind, soon withdrawing itself from all sides, becomes firmly established in God. He who has not controlled his mind and senses can have no reason; nor can such undisciplined man think of God. The unthinking man can have no peace; and how can there be hapiness for one lacking peace of mind?